Wordplay is fun. The title might make someone (from another planet) think that this post was about babies learning to weave. In fact, it’s about weaving things for babies to use, specifically handwoven baby blankets. So I decided to simply ignore that section of the book. Along with several other sections I didn’t understand. Hoping that all in good time, it’d make sense to me. Or that I wouldn’t need or want to do it. Amazingly, I was right – I could understand! So I had to figure out what I needed to make to use the technique while it was hot in my brain. My answer – use up some baby acrylic and make a handwoven baby blanket! I’d woven a blanket for a friend’s baby about a year earlier, and had to weave it in two strips and stitch them together. Although the friend was really gracious, the baby blanket was less than lovely. Weaving a blankie in one piece would be WONDERFUL! So with several false starts I figured out how to follow the instructions, and wove a checked baby blanket that made me happy. It wasn’t perfect, but it was really quite nice, and I was very satisfied with my first attempt at doubleweave. I put it up on my website, but had no idea if it would sell or not. Imagine my pleasure when it sold at the first show I brought it to! Having another show the following weekend, I decided that I’d use the intervening days to weave another baby blanket, this time from a lovely handpainted cotton flannel. I was even happier with the results, and brought it to show #2 of the year. IT SOLD!! I didn’t even get a photo of it before it was gone. I figure that I’d best make more handwoven baby blankets. That’s what I’m working on now, turning this lovely little cone of baby-colored cotton flannel yarn into a blanket. Watch for my progress. Terrific!!!! Sure to be a winner!!!! Judy – Thanks for your support & encouragement. I’ll get my first potential customer reaction in just a week. Sarah loves the blanket you wove for her! Kristen – Sarah is, of course, the baby I referred to in the post above, and you (two) remain remarkably gracious. Hello.I am searching for a diamond pattern to use for a baby’s shawl. The example at the top of this page would be perfect. May I know the lifting pattern,tie-up, etc please? I will be weaving the shawl using 110/3 Merino. I did a simple straight draw for both warp and weft for this baby blanket, and just a plain weave. Let me know if you have any other specific questions. 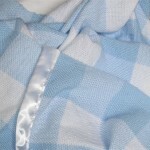 How do you secure weft ends to ensure there will be no unravelling with washing and heavy use? Hi, Melissa. I do a few things to make sure my baby blankets won’t unravel. When I take them off the loom, I do a row of straight stitch and a row of zig-zag along the very edge on my sewing machine. Then, I machine stitch the binding on, adding another level of security. So this is how it all started! Very neat! I am enjoying reading through your archives! 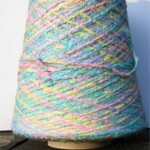 Do you mind telling where you got cotton flannel yarn? I am trying to design a blanket for some very picky parents, and I think that would meet their requirements for fabric content and mine for durability. Sure, Jane. I got variegated cotton flannel yarn on ebay from Fiber Options and had some custom dyed for my by Yarntopia Treasures through Etsy. Good luck with your baby blanket!